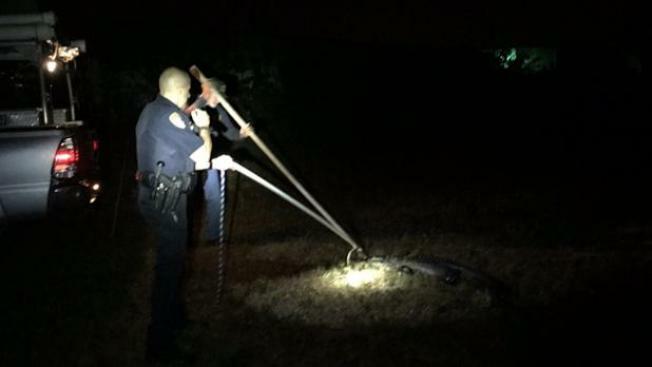 Police came to the rescue of a badly injured alligator that was missing a portion of its tail as it casually crossed a street in a residential neighborhood early Tuesday in southwest Florida. A Cape Coral police officer was conducting a check of the 2400 block of Northeast Seventh Place in North Cape Coral when he spotted the hurt alligator crossing the street in a residential neighborhood. Officers called in FWC for assistance and successfully removed the gator. They believe the alligator would have measured close to eight feet if long if it weren't missing its tail. FWC tells NBC affiliate WBBH that the gator was turned over to a trapper who would determine its disposition. In some cases, it is deemed more humane to euthanize the alligator. An alligator missing a tail is not an unusual sight. According to the report, the FWC says it can happen while gators are young and subject to predation from a wide range of animals, including larger alligators.